Ever felt the need to restrict some payment methods on any or all of your products available in your Prestashop store? Well, if yes is your answer, Prestashop Product Wise Payment module is exactly what you need. This module allows the admin to select the products on which he wants to assign the restricted payment methods. 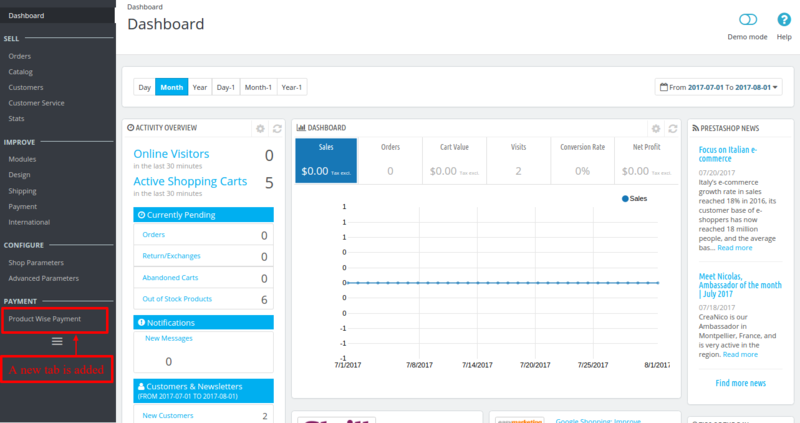 Admin can set the number of products to be displayed in the products list and the view more option on the page will display the rest of the products he set to appear. Admin can set the mode to either Default or All depending upon the requirements. Admin can assign multiple restricted payment methods to multiple products at once. Buyers will able to see only those payment methods on the checkout page which have not been restricted i.e only the available payment methods associated with that product will display. Admin can edit/delete the restricted payment method associated with that particular product. Admin can choose to allow all payment methods or disallow payment, in case multiple products are added in cart, which does not have any common payment method available among them. Module would be automatically installed. After successful installation, admin can now configure the module. Here admin can set the number of products that will be shown in the products list. Also, number of products that will be shown when view more is clicked can be set here. Now when following modes have been set in the configuration, let’s see the behavior of payment methods on the payment page. Default: When the mode is set as default. Case 1: When you have 2 products in the cart and both are restricted by different payment method. In this case, since we do not have any common method available. Therefore, there will be no payment method available for this order. Case 2: When you have 2 products in the cart and both are restricted by the same payment methods. Well, in this case, all the other payment methods will be available. Case 3: When you have 2 products in the cart and one product is restricted by some payment gateway and the other product has no restriction (i.e. all payment methods are available). Then, the common payment method will be available to the buyer. Case 4: When you have 2 products in the cart and no restrictions have been applied to both the two products, then all the payment methods will be available for the buyer on the checkout page. All: If the mode is set as All. Case 1: When you have 2 products in the cart and both are restricted by different payment methods. In this case, all the payment methods will be available to the buyer. Case 3: When you have 2 products in the cart and one product is restricted by some payment gateway and the other product has no restriction. In this situation, all the payment methods will be available to the buyer. This is how the module can be configured. A new tab ” Product Wise Payment ” will be added in the back office. Admin can click on “Add Product Payment” to assign payment options to products. Admin can enable/disable the payment option assigned to the products. Here admin will find the list of products that are available in their Prestashop store and the payment methods. Admin can select one or more products and can assign multiple payment options which he wants to restrict for those products. Once the products have been selected and the payment methods have been assigned to the products, a list will be displayed showing all the assigned payment methods (restricted). Admin can edit/delete any assigned payment method (restricted) from here. From the edit option, admin can simply delete the assigned payment method (restricted) or edit the payment method associated with the product. Once the payment methods have been assigned to the products. Only the available payment options will be shown to the buyer for these products, to complete the purchase. So this is how the admin can restrict multiple payment methods to products using this module. We hope we were able to explain to you in a very descriptive manner. Still, have any queries? write us at support@webkul.com or just raise a ticket at http://webkul.uvdesk.com and we will come back to you with the desired solutions.